If every promise made at the Paris climate summit is kept, the Earth’s average temperature is estimated to rise by about 3° degrees Celsius. Mankind did not exist at the time when the Earth was 3° degrees warmer. 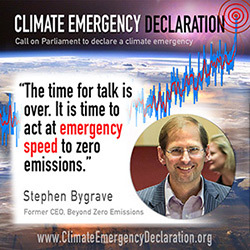 If we wish to keep temperature rise below 1.5° degrees we must declare a climate emergency and stop burning fossil fuels now. If we wish to keep temperature rise below 2° degrees we cannot burn all of the fossil fuels that are in existing mines and wells. • The Syrian conflict was preceded by the worst long-term drought and crop failure since civilisation began in the region. • This is the start of the many climate related conflicts to come. Australia will not be immune. • This year 70% of the northern section of the Great Barrier Reef was lost with the most severe coral bleaching event ever recorded. • Half of the reef south of Cooktown had already died in the previous 25 years due to coal port dredging and agricultural pollution. • Nature is rapidly vanishing. • Droughts are getting longer and more severe, impacting on food security. • Wet weather events are becoming more intense and destructive. • Heat waves are already magnifying the fire risk around the world and causing heat stress deaths. • We won’t be able to afford to continually re-build after severe weather events. • There are already places in Australia that are uninsurable for cyclones and severe weather. • Massive poverty will be created from new coal mines – not alleviated. Sea level is already rising and forcing people living on low-lying islands and deltas to reclocate. Current government policy commitments will see the melting of all icesheets and a corresponding 70 metre sea level rise. Even a 2°C degree rise above preindustrial temperatures will result in a sea level rise of about six metres. 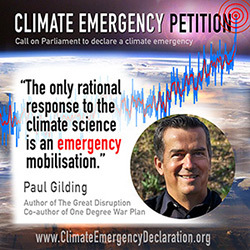 If enough people demand it, governments could declare a climate emergency tomorrow and immediately mobilise resources at the massive scale and speed that we know is possible when lives are at stake. and ask your friends to sign. Add it to your email signature and promote it on social media. Make it a familiar part of the public conversation! • Buy green electricity or install solar panels. • Move your banking, super, and investments away from funding fossil fuels. Avoid unnecessary consumption. 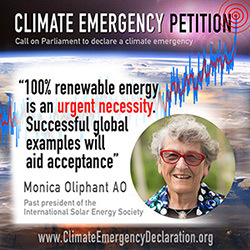 • Urge State and Federal members to support a Climate Emergency Declaration. 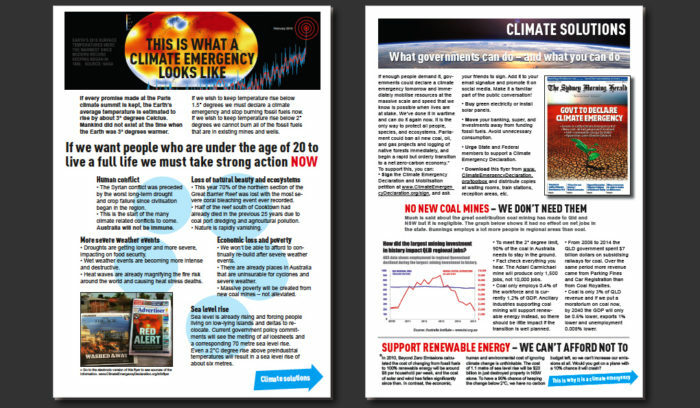 • Download this flyer from www.ClimateEmergencyDeclaration.org/toolbox and distribute copies at waiting rooms, train stations, reception areas, etc. Much is said about the great contribution coal mining has made to QLD and NSW but it is negligible. The graph below shows it had no effect on net jobs in the state. Bunnings employs a lot more people in regional areas than coal. • To meet the 2°C degree limit, 90% of the coal in Australia needs to stay in the ground. • Fact check everything you hear. 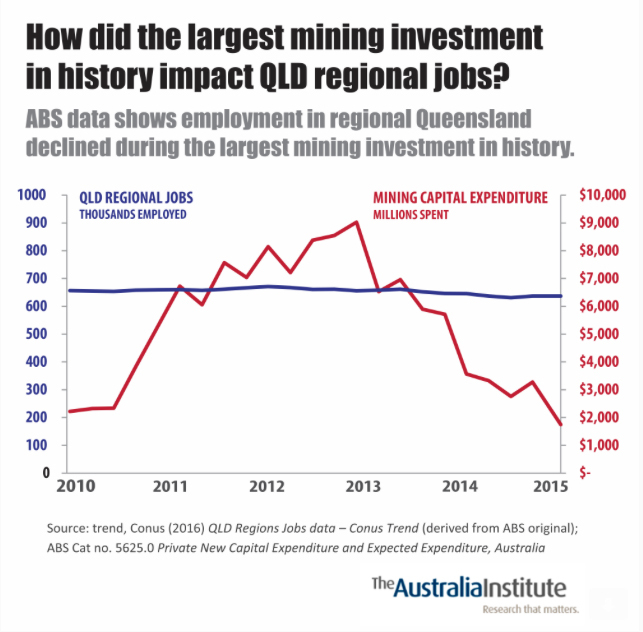 The Adani Carmichael mine will produce only 1,500 jobs, not 10,000 jobs. • Coal only employs 0.4% of the workforce and is currently 1.2% of GDP. Ancillary industries supporting coal mining will support renewable energy instead, so there should be little impact if the transition is well planned. • From 2008 to 2014 the QLD government spent $7 billion dollars on subsidising railways for coal. Over the same period more revenue came from Parking Fines and Car Registration than from Coal Royalties. • Coal is only 3% of QLD revenue and if we put a moratorium on coal now, by 2040 the GDP will only be 0.6% lower, exports 1% lower and unemployment 0.008% lower. *In 2010, Beyond Zero Emissions calculated the cost of changing from fossil fuels to 100% renewable energy will be around $8 per household per week, and the cost of solar and wind has fallen significantly since then. In contrast, the economic, human and environmental cost of ignoring climate change is unthinkable. The cost of 1.1 metre of sea level rise will be $20 billion in just destroyed property in NSW alone. To have a 90% chance of keeping the change below 2°C, we have no carbon budget left, so we can’t increase our emissions at all. Would you get on a plane with a 10% chance it will crash?